Happy Kitchen Sink Stamps Monday! It's NEW RELEASE time in the Kitchen! TODAY ONLY, Monday May 24, when you place and order at Kitchen Sink Stamps you can save 20% on your total purchase. Just click here, then enter code LISA20KSS. If you're reading this post at a later date, you can always save 10% off your purchases by clicking here and using code LISA10KSS. New to the Kitchen this month are two beautiful Wedding Sets, Multi Step Wedding Couple and Multi Step Wedding Rings. 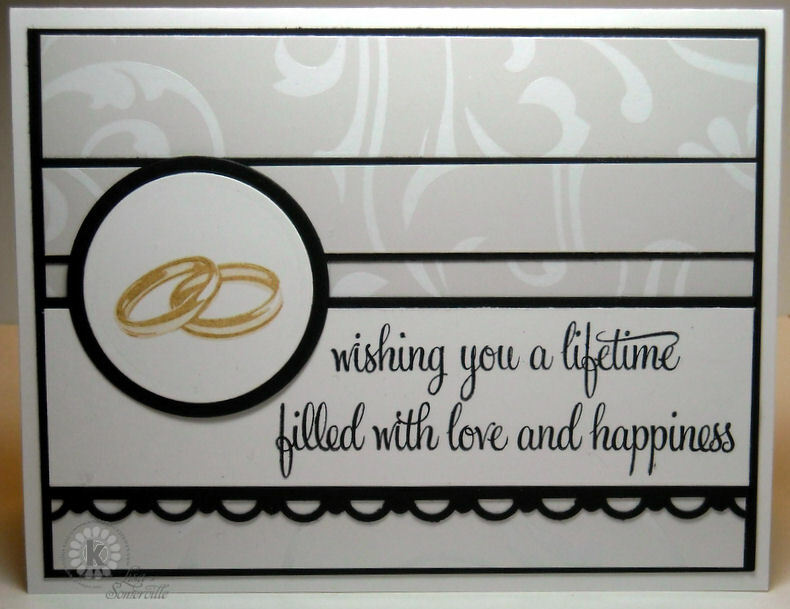 I used the Wedding Rings set to create the card shown above, using OCCSC16 as my sketch inspiration. Stamping the rings on White, then cutting with Spellbinders Circle Dies. I used a SAMJ to add the sentiment from this set to the White panel in Black. The lovely White pattern paper is from Meringue Pearl Paper by SEI. Absolutely beautiful wedding card Lisa. 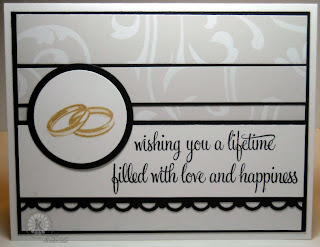 Beautiful wedding card and sweet sentiment. What a gorgeous wedding design for these beautiful rings!! A sophisticated beauty!! Wonderful work, Lisa! I love the spotlight on the wedding bands...so elegant. This layout lends itself well to your beautiful creations. What a great card! Love how you layered your papers. Very classic! Thanks for playing at OCC Sketch. So beatuiful and elegant, Lisa! Love the papers you used...just perfect with this image!! Super beautiful wedding card, Lisa! I love the white space and black layers...just stunning! How lovely and elegant. I love your style.